Melissa N. Paddy graduated from Archbishop Spalding High School in Severn Maryland in 2008. Melissa went on to pursue a Bachelor of Arts degree in Political Science with a minor in Legal Policy at the University of Maryland, Baltimore County, from which she graduated in 2012. Melissa is currently attending the University of Baltimore School of Law and anticipates graduating with her Juris Doctor in May of 2018. With over seven years of experience as a Paralegal, Melissa handles all aspects of personal injury cases. 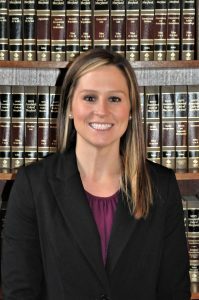 Prior to joining Silver Kolker LLP in 2015, Melissa was employed at three other personal injury firms in the Baltimore area where she gained valuable experience managing and pursuing a high volume of personal injury claims. As Office Manager, Melissa oversees the day-to-day functions of firm operations at Silver Kolker LLP. Melissa enjoys spending time with her three dogs, Crossfit and being outdoors.